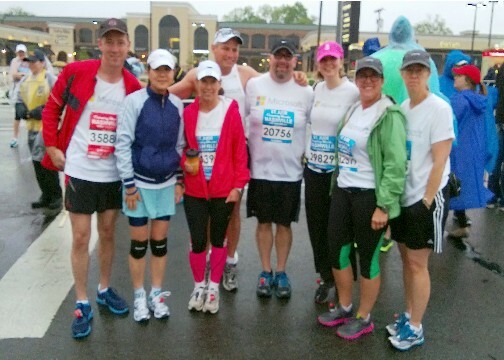 This is the 3rd year in a row that David pulled the Microsoft team together to run the Half Marathon and Marathon! We had over 20 people run this year (you do not see them all in the photo due to the fact that they did not arrive in time for pictures). This year’s run was the toughest as it was very cold, around 40 degrees. On top of that it rained (poured) the entire time from the time that we were dropped off by the shuttle bus to the time that we finished the race! The winds were also very strong which really made it hard to stay positive on this one! David and I did not run this one together and I will have to say that the miserable weather made me run the entire way! Usually, I do a walk/run but there was no way that I was going to walk in this weather! I remember about a mile out from the finish line and the rain/wind picked up tremendously. I remember saying to myself “really?” and just shrugging it off and getting it done! There were several folks already done with the race but they did not stick around and I cannot blame them! We grabbed a few bananas and some chocolate milk and headed back to the car and to the Flying Saucer! I know that many of the folks that did this for the first time were very upset and have said that they would not do this again! I am hoping that they have a change of heart in the future as this is really a great fun race! All the Microsoft folks getting together to work towards a common goal! The cold,cold weather and my wet, wet shoes! Trash bags over our bodies! Running faster than I had ever run, just to get DONE! Having a beer together at the flying saucer!